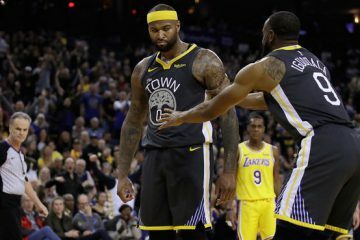 There is only so much you can do against a Golden State Warriors team that is indomitable in the structure of the setup, the chemistry of its egos, and the all-encompassing MVP solution no one has ever seen. That’s what the Houston Rockets had to deal with Monday night in its 119-106 loss. The gloomy trudge off the floor said it all, and the realization of what needs to happen not just once, twice, or thrice more times in the next 6 games would make a Herculean task appear more fruitful. The Warriors win Game 1, make a statement, on the series, and are well on their way to the 3rd title in 4 years. There wasn’t a singular moment where the Warriors turned the tide against the Rockets’ superb start. A 12-4 start against the Hamptons 5, Andre Iguodala with 2 quick fouls, Draymond Green with a T, and an isolation offense against Steph that tired him down throughout. It was a dream beginning. And then it ended with a 30-29 lead for the Houston Rockets. Kevin Durant’s scoring is so common and easy that it’s become quite commonplace to call each performance “quiet”. His 35 was anything but, starting with a bevy of fadeaways going backwards, falling sideways, and running through a locked in and extremely aggressive plethora of Houston defenders. They were as hopeless as any 65-win one-seed favored home team could be. Helpless. The tide did not come then, however. Not when KD was keeping the Warriors afloat while everyone around him seemed frazzled and overwhelmed. 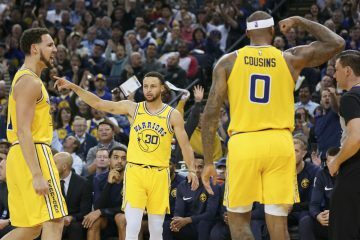 It came when the shots starts to ease up, Klay Thompson started getting layups, Stephen Curry turned his 3pt aerial assault into an assortment of rim finishes, and role players like Shaun Livingston and Nick Young garnering wide open looks off simple off-ball actions. They had weathered the wave, and exposed the Rockets for who they were, a team built to defend them in spurts, but never consistently. 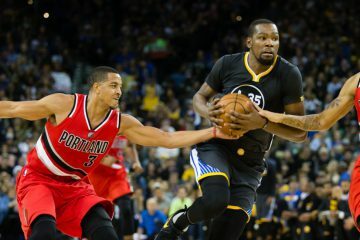 It would take another full quarter for the Warriors to recalibrate before the Third Quarter Run began but the shots were beginning to fall. The cracks in the Rockets defense was breaking, and the Warriors defensive gameplan spearheaded by KD and Draymond Green began taking over. Perhaps the greatest indictment of KD’s greatest game as a Golden State Warriors came late in the third quarter. Up 13, Kerr took him out with a few minutes in the 3rd for some ostensible rest. Steph airballed a dagger 3 next, the Warriors let the Rockets get within 5 almost instantly, and not but a minute later KD was back in to salvage an 8-point to start a dominant Warriors fourth quarter. Game 3’s transition shot over LeBron James is KD’s iconic moment as a Warrior. But this one, saving their behinds on offense over and over again, replicating what Steph has done repeatedly the last half decade. To the point where no matter who handled the ball, the Warriors looked as lost as a lottery team. Sound familiar? This is the penultimate Durant moment, until the next one, and there are certain to be more after that. But like Steph’s Game 7 at home against OKC, Draymond’s defensive masterpieces in every single large postseason affair, and Klay’s otherworldly Game 6, Durant’s impossible-ness epitomized every single reason the Warriors recruited him for over two years to get him here. The long Rockets defense, the wearing down of Steph, and the postseason dragging of pace all fits into how Durant danced, and hesi’d, and danced one more time before shutting off the lights in Houston. Now it’s 1-0 for the Golden State Warriors against a Rockets team that sent them their MVP’s best shot. The series is nearly all but over but now the Warriors look to truly crown themselves as one of, if not the greatest team of all time. 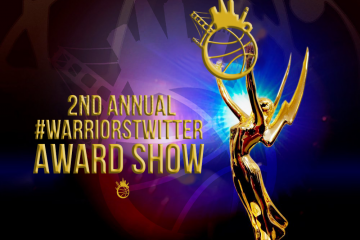 Because 1-1 is fine going home, but if Warriors shut this thing down Wednesday night, we are going to see a show this weekend. 1. Nick Young actually balled out. The spiderman meme jokes aside with Gerald Green, Steve Kerr made a superb rotational adjustment by playing him just against the Rockets bench and leaving no room for error if he plays a single bad second. 3 3s in 15 solid minutes. 2. Kevon Looney needs to be re-signed. He did next to nothing on offense but gamely jumped out on James Harden and Chris Paul isolations and did not foul. They combined for 64 points on 22-41 shooting but that’s how great those two are pounding the ball into the ground. Three shot clock violations and no obvious slashing lanes and easy layups. The Warriors gameplan was to give the Rockets those contested midrange Js. Those two made a lot, but they’re better than easy layups, drive-and-kicks, and fouls on 3s. No other center on the Warriors could have posted that effort. 3. How about Stephen Curry’s Chris Paul-esque Point God game, eh? 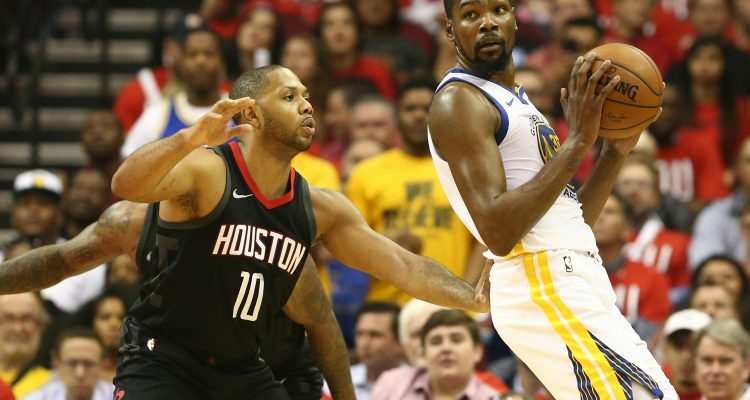 Now that Houston has transformed the true point guard into an isolation specialist, Steph came out and gave us a look at how an offense should run with an unselfish leader at the helm. Still out of shape in an incredible postseason atmosphere, he knew he didn’t have his shot or the ability to gain as much separation as normal. Cue up 8 assists to 1 turnover and several nifty finishes at the end of the game to keep the Rockets in the rear view mirror. Keep monitoring the conditioning as the Rockets wore Steph down late and made him a non-shooter. 4. Klay Thompson and Draymond Green did their own version of saving the game with some huge shots from Klay (including a phenomenal celebration to the crowd) and some splendid DPOY helpside defense against a Rockets bench that leaves much to be desired in shot selection. 5. When does James Harden and Chris Paul realize this is a losing effort and start to mail it in?